Ex On The Beach spoilers show tense moments with Kareem Peterson and the entire house – including Farrah Abraham. Things ended on quite the cliffhanger last week as Kareem and ex Mya Benberry made their way to the Shack of Secrets. This week, viewers see the aftermath. Spoilers expose that it’s incendiary yet again. Mya rages and Kareem feels the heat. Last week on Ex On The Beach, Mya and Kareem were the first to experience the Shack of Secrets. Initially, it looked like the two exes were on a road to patching things up. While Mya had initial chemistry with fellow cast member Malcolm Drummer, it looked like the spark was still there between Kareem and Mya. Things took a turn for the worse in the Shack of Secrets, however. While there, Kareem Peterson’s cousin revealed on video that he hated her stuck-up attitude and couldn’t deal with her snobbish ways. Further, he cheated on her with six people in one day. As if that’s not enough, there’s more on Ex On The Beach. The icing on the cake is that he bet the football team that he could land her. They were getting to a good place, but bombs drop this week. It’s clear that no one is safe from their past. They are the first couple to experience this. More secrets come to light as the season progresses. Farrah Abraham is on the outs with her fellow Ex On The Beach cast members. She’s clearly the most recognizable face in the house. Along with that, her diva attitude is in full swing. She got into an explosive shouting match with Cheyenne Parker last week. He essentially called out her behavior and how it was rubbing the entire cast the wrong way. He did land a low blow in the eyes of many cast members when he said in so many words that he didn’t have to have a kid to be famous. Ex On The Beach spoilers reveal Farrah steps up this week when it counts. As a veteran of the Teen Mom franchise, Abraham is well versed in drama – both creating it and handling it. 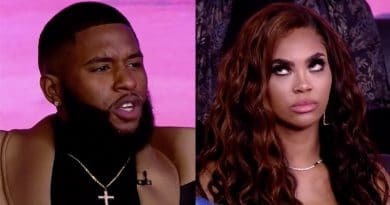 Spoilers indicate when things start to escalate with Kareem Peterson, Farrah Abraham is the first one to come at him and aggressively shut things down. She essentially comes at him like a mama bear defending her cubs. She got off on the wrong foot last week with her fellow cast members. Maybe this display will get her back in their good graces. It’s worth seeing how things go down this week. This week’s episode of Ex On The Beach is explosive. The fallout from the Shack of Secrets is revealed. How will things go down between Kareem and Mya? She had initial chemistry with Malcolm Drummer, and maybe he’ll use this to his advantage. Ex On The Beach kicked things off last week with an explosive opener. It looks like this week will be no different. Catch a new episode of Ex On The Beach Thursday at 8 PM only on MTV. Come back to Soap Dirt for the latest Ex On The Beach spoilers, news, and leaks. ← ‘General Hospital’ Spoilers: Kevin Tricks Ryan – Will Doc Save Himself?